Blatant Homerism: What will be the biggest change to the FSU defense under new coordinator Mark Stoops? Rich: Different looks and coverages. Our previous, long-time d-coordinator, Mickey Andrews, built some great defenses during FSU's dynasty days, when the 'Noles won two national championships. But Andrews' mostly man look became far too predictable. Combine that with a decline in overall defensive talent, injuries and poor coaching of some segments, and it all hit the fan last year: The absolute worst D we've had in decades–maybe ever. Here's what Coach Fisher said this week about those different coverages: "I think Mark's had a great pedigree and a great history of not only being a great coordinator but a great secondary coach. I think he'll be very multiple. He'll play a lot of man coverage along with a lot of zone coverage." 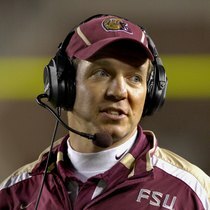 BH: How concerned are FSU fans about the transition from Bobby Bowden to Fisher? I'd assume the "coach-in-waiting" arrangement helped alleviate some of those issues? Honestly, what was Bowden actually doing the last few seasons? Rich: Back in December and January, FSU fans were very concerned about the coaching transition. But Jimbo has done a masterful job of winning over everybody from emotional fans who believed Bowden was done wrong to former players who were fiercely loyal to Bobby. The coach-in-waiting arrangement helped to a small degree, in that Fisher wasn't a stranger to 'Nole fans in the admittedly awkward transition. But it was far more beneficial for Jimbo. He knew exactly where the problems were, what to fix and who should go. Stuff that most new head coaches take the first season to figure out. What did Bowden do in his final years? He definitely became more of a CEO. While he was committed to the team and was a colorful representative for the school as a college football legend, it was apparent to many of us that the fire had gone out. When he announced his retirement, a vocal segment of 'Nole fans thought he'd been forced out. Few will ever know how it happened–what took place in the meeting between Bowden and the university president, a former player who had once been coached by Bowden. But I see it much like the difficult, yet necessary, decision to take away Grandpa's car keys. BH: FSU landed a strong recruiting class this year. How many of the young pups will see action right away? Rich: Hard to say. But two that definitely will are linebacker Jeff Luc and defensive back Lamarcus Joyner. Luc was considered the No. 1 linebacker recruit on the globe and is chiseled like a pro. In fact, he looks like he's entering the NFL draft instead of his freshman year of college. He just might be in the starting lineup when the 'Noles come to Norman. That's due to Luc enrolling early and having a spring practice under his belt. And, unlike returning linebackers, he won't have to erase the old schemes from his memory bank to learn what Stoops is teaching. Lamarcus Joyner is a five-star DB and member of the ESPNU top 150. Joyner played safety for the top high school program in the country, St. Thomas Aquinas of Ft. Lauderdale, but appears destined for cornerback at FSU. However, Joyner didn't make it in for spring practice. So, because the OU game is only the second of the season, Sooner fans may only see Joyner in nickel situations -- or running back kicks. Also, look for juco transfer Debrale Smiley, a big, slashing fullback with speed. BH: From an overall talent standpoint, how does this team stack up against the best FSU teams historically? Rich: Probably a few steps behind in terms of talent, and in a catch-up mode from a coaching/development standpoint. If Bowden's best teams were an A this one could be a B-. Although the offense should be one of the best in the nation. Quarterback Christian Ponder was a passing stat leader before his late-season injury. And FSU has the deepest stable of multi-talented running backs that I can remember. BH: If you could name one thing about the Oklahoma game that worries you most, what would it be? Rich: If Landy Jones gets hot and our secondary isn't up-to-speed yet to stop him. By the end of the season, I think our DBs will be a strong unit under Stoops' tutelage. But we'll see if they're fast learners when they get to Norman. One thing's for certain. Between Jones and Ponder, this game should be a helluva of an exciting, non-stop aerial show.